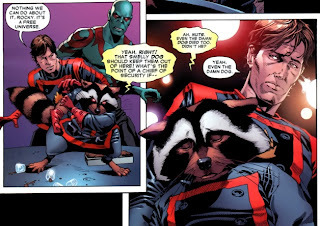 Things were moving along great with the Guardians of the Galaxy series. The team had split apart, only to slowly come back together. 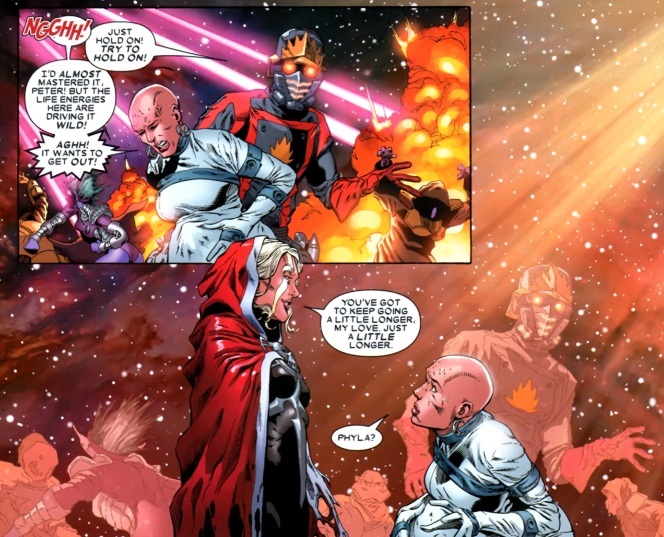 Moondragon was reborn, and Star-Lord returned as the leader of the team. Then War of Kings happened. 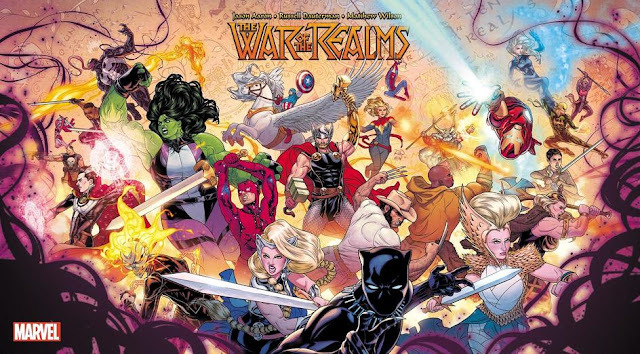 As good as parts of the crossover event were, they weren’t as good as the Guardians series, with even the Guardian tie-in issues surpassing the main series in terms of entertainment value. But what did come out of the event are two very important things: the massive fissure in space and time called “the fault,” and the corruption of Adam Warlock into his evil self from the future, the Magus. With half the team murdered at the feet of the evil Magus, and the other half seemingly perished in an alternate future, things look pretty bleak for our hapless heroes. I got Jefferson Starship blasting in my headphones, I’m re-motivated, let’s do this thing. 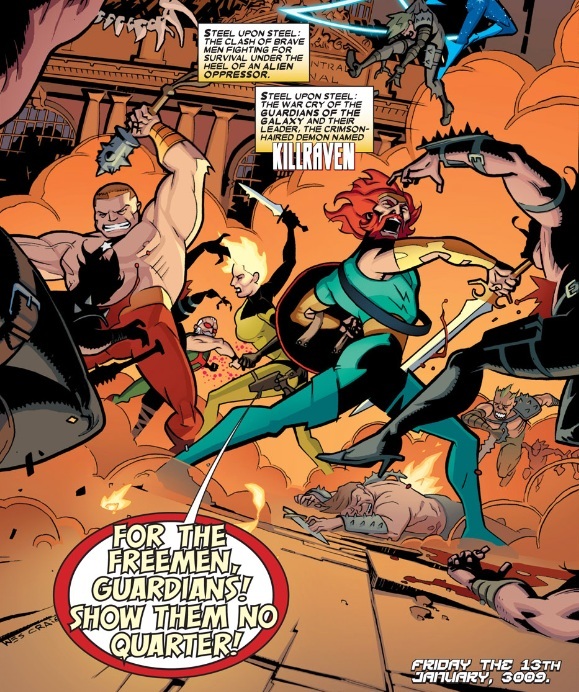 In the year 3009, Killraven leads the Guardians of the Galaxy (original ‘70s version) against an alien army. They have them beaten back, until the infamous tripod war machines arrive (War of the Worlds style). At the same time, Star-Lord, Bug, Cosmo, Mantis, and Jack Flag appear. However, Star-Lord has been aged to grampa level, Mantis is a baby, Bug is a teenager, Cosmo is an impulsive puppy, leaving Jack Flag as the only one seemingly unchanged. They combine forces with Killraven, the other Guardians, and a geriatric Wonder Man to crush the Martian-like tripods. Starhawk suddenly sees all his/her other selves and remembers who the mysterious strangers are. 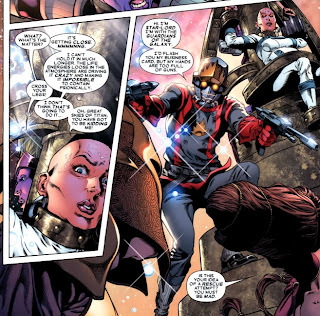 Later, under the safety of cover, Starhawk explains to them that time still remains damaged, and Star-Lord and his team are slipping in out of realities as the ripples carry them. The future tense is in flux, with them caught in the timestream, where they will continue to age in random ways until they cease to be. However, Jack Flag is aging sideways, slowly evaporating from reality, due to his special nature. According to Starhawk, he is the chosen one, destined to reshape the universe. Star-Lord, determined to get home, asks Killraven where they can find a time machine. There is one deep within the Keeper’s main command node, located inside the old Avenger’s mansion. Wonder Man leads them through the underground tunnels into the mansion, where they are attacked by the Keepers. Just as they make it to Doom’s time machine, time shifts again, and they find themselves traveling from one alternate future to the next. Finally, they find themselves on a familiar looking platform, where a statue of the Magus towers over them. As they contemplate the evil looking Adam Warlock, they are surrounded and attacked on all sides by the Universal Church of Truth. My brain thoughts: This is it. The return of high octane action and humor as only the Guardians can provide it, unencumbered by outside storylines. With War of Kings over, they can now launch fully into their own storyline up against the evil of the Magus. Not even the presence of Wonder Man can ruin things here. Star-Lord and the Guardians are pitched in battle against the Universal Church of Truth. A time door opens, and dozens of Starhawks come spilling out, followed closely behind by Kang the Conqueror. 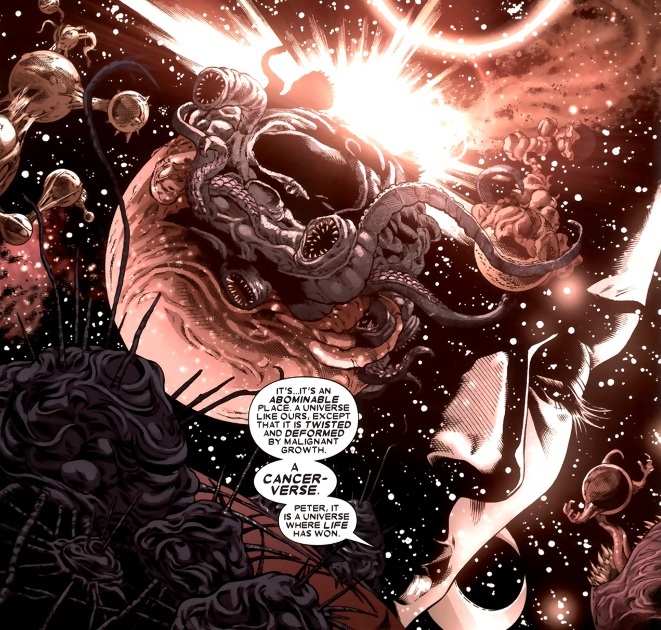 Kang convinces Star-Lord and his team to return to limbo with him, curing them of their various time-related afflictions with a wave of his hand. Back at his home base, Kang explains how he has been collecting the various Starhawks from different timestreams, to help him fix the temporal conflict. He goes on to explain how there warning was successful in preventing the fault from spreading over the entire galaxy, but that Adam Warlock had been consumed by his evil self, the Magus, in the process. Adam Warlock, in using the Magus future as a tether to keep the fault from spreading, inadvertently started a chain reaction where all iterations of the future are becoming one. 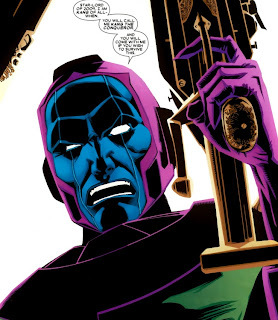 Kang proposes to send Star-Lord and his team back to the moment before Adam Warlock becomes the Magus, and arms him with a Cosmic Cube to stop him. Star-Lord balks at the prospect of having to kill Adam Warlock to save the universe, but before the discussion can go any further, Kang’s fortress is attacked by the Universal Church of Truth. 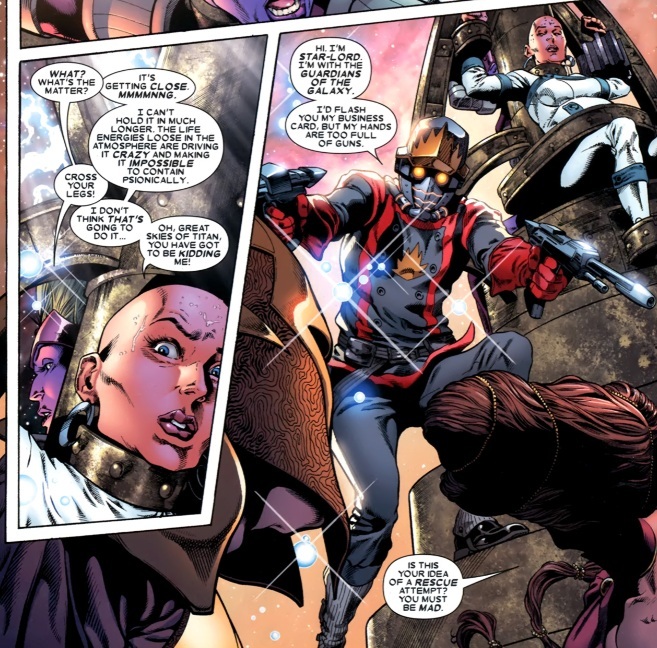 Kang sends Star-Lord and his team on their way back through the timestream. 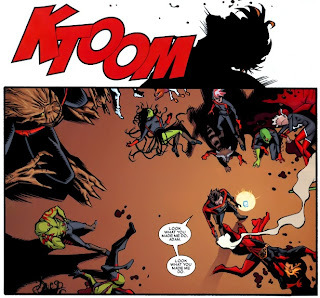 They arrive back at the moment before Phyla Vell attacks Adam, and prevent her from doing so. Rocket Raccoon and the other half of the team arrive on the scene, and Star-Lord uses the power of the Cosmic Cube to pause time, in an effort to convince Adam to fight off the Magus. But it is already too late, as Adam himself reveals, he has been the Magus for several months already. Magus attacks Peter, and the Guardians attempt to fight back, with Cosmo and Mantis the early casualties. Phyla Vell attacks him with her death-blade, which he quickly takes from her and uses against her, killing her. Gamora and Major Victory are the next to die, and Star-Lord finally recovers and regains the Cosmic Cube. He uses its power to hold Magus in check, bringing Adam Warlock back in control. Adam Warlock begs Star-Lord to do what needs to be done, and he does, shooting Adam in the head. Star-Lord, Bug, Jack Flag, Groot, Drax, and Rocket Raccoon arrive back at Knowhere, where they are greeted by a devastated Moondragon. Moondragon has nightmares of her teammates, and her lover Phyla, falling in battle against the Magus. As the only remaining telepath, she decides to suit up and help the team. Star-Lord and the rest have been examining and investigating the fault. Moondragon makes telepathic contact with Rocket and Drax, who have gone outside to install equipment to monitor the fault. 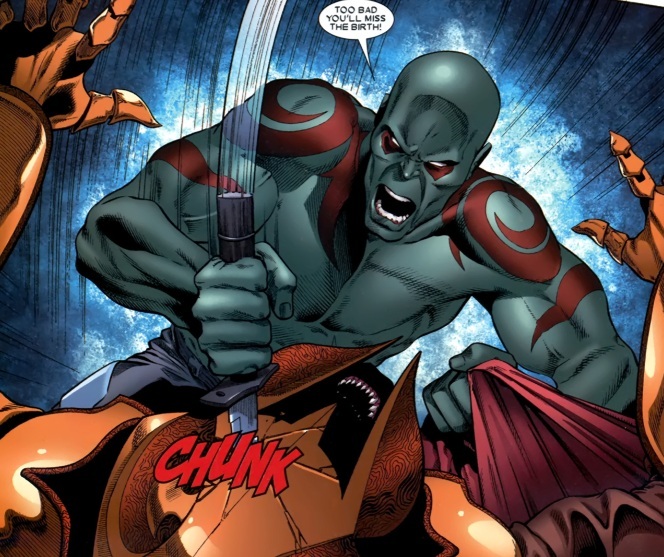 A creature comes through the fault and attacks them, but meets his end at the hands of Drax. Later, Star-Lord has Moondragon accompany him to a Knowhere council meeting. 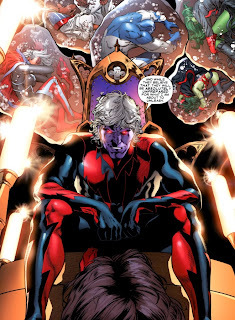 The Universal Church of Truth now has a delegation representing them on the Knowhere council, and they demand retribution for the murder of Adam Warlock. Cynosure of the Luminals demands they be included on any future exploration of the fault. Moondragon is pulled away of the proceedings by a vision, of the mysterious cocoon maintained by the U.C.T. In the vision, the occupant of the cocoon begins to emerge, and speaks to her, causing her to faint back in the real world. Later, the Guardians have some drinks at the Knowhere bar (Starlin’s bar). They are still recovering from losing many of their teammates and friends. Moondragon interrupts them telepathically. Cynosure led the Luminals on a scouting mission into the fault, and they had brought back something dangerous with them, that is now attacking everyone at the cortex. One of the Luminals has been infected with an unknown parasite, and its head splits open and heads for Moondragon. My brain thoughts: I really don’t care about Moondragon at all. 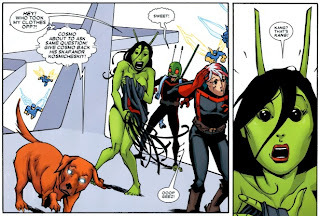 She is not fair trade value for losing Mantis, Cosmo, Gamora, and Phyla. I don’t like it when they take away half of the team as they appear fond of doing. The team is better together than they are individually, and taking away half of them (especially the naked green ones) leaves a gaping hole (heh heh). But maybe that’s the point. Moondragon is under telepathic attack by the parasitic creature from the fault, as it tries to make her its new host. She fights back, trying to hold it off with her telekinetic abilities. Star-Lord and the others arrive, and he immediately begins to berate Cynosure for investigating the fault on their own, and bringing back something with them. The Universal Church of Truth arrives, uncontrollably drawn to the creature by its telepathic abilities, and believing it to be something to worship. The creature escapes, taking a member’s of the Church’s head off as it does so. It tries to take control of Cynosure, but Moondragon intervenes, allowing herself to become its host. Later, Star-Lord visits Moondragon quarantined in a sick bay, appearing from the outside to be pregnant. 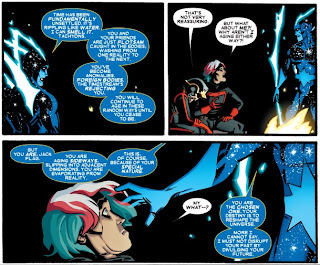 She explains to Star-Lord that she took on the parasite because only a telepath could contain it, and that doing so prevented it from taking any more lives. She is also learning about it, studying it. Moondragon has learned from it that the fault has a singular location on the other side, a twisted and deformed universe called the Cancerverse, where all life has won, and death does not exist. Cynosure and another Luminal named Jarhead arrive, demanding to interrogate Moondragon. They wish to “extradite” the parasite so that it can put it on trial for the murder of their teammate. While Star-Lord argues the insanity of their demands, Cynosure bonds herself to Moondragon via biometric cuffs, which will kill them both if tampered with. One hour later, the council debates what action to take going forward. 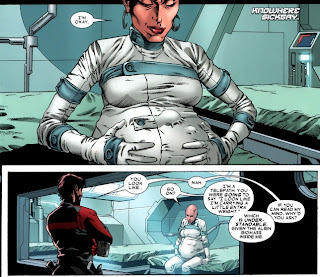 Drax invokes his parental rights as Moondragon’s father, buying the Guardians some more time to come up with a plan. When Drax goes to visit Moondragon in the sick bay, he finds a Universal Church of Truth Cardinal in the process of kidnapping Moondragon and Cynosure. 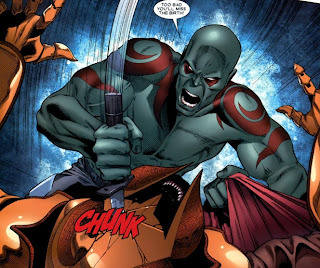 Drax fights the U.C.T. soldiers, but is eventually stopped by the Matriarch herself, who causes him to experience all the pain he has ever inflicted in his life at once. As Drax writhes on the floor in agony, the Church escapes with Moondragon. My brain thoughts: I’m kind of sick of the Universal Church of Truth, and not in a “I love to hate them” kind of way. Putting aside Starlin’s reasons for creating them in the first place, I’m just over it. Stupid Moondragon. Still a good issue though, don’t stop reading. The Matriarch believes the parasite inside Moondragon is their new God, and is using the power of their belief engines to birth it into reality. As the ceremony begins, Star-Lord and the others arrive to rescue her. 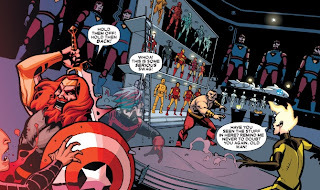 The Guardians have transported all of Knowhere directly to Orison, the Church-controlled location where Moondragon is being held. The team leaps into battle, including Drax, who recovered quickly from the Matriarch’s attack. 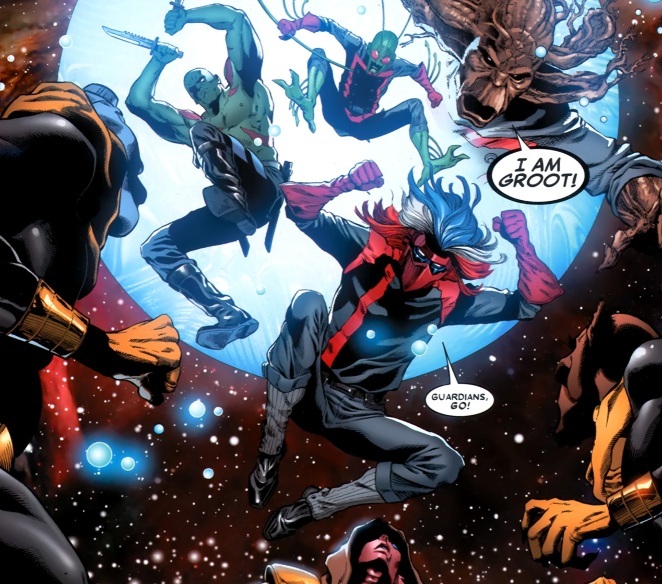 Drax faces off against Cardinal Raker, as Star-Lord frees Moondragon and Cynosure. Moondragon struggles against the creature inside her, but is calmed by a vision from her dead lover Phyla. 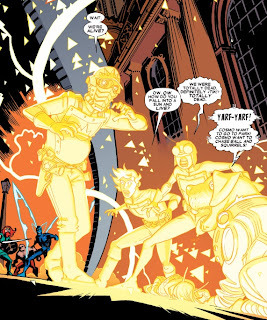 The Luminals arrives to back up the Guardians, and Drax finally puts Raker down permanently. 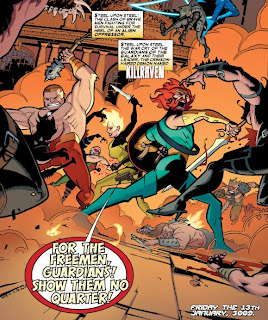 The Guardians successfully escape with Moondragon, and return Knowhere back to the edge of the universe. The council is outraged by the Guardians' actions in moving Knowhere and storing the entire population of the facility in a tesseracted storage crystal, but the Luminals back up Star-Lord, as part of a new unified front of cooperation. Later, the parasite having been extracted from Moondragon and locked into a container, Groot throws it back into the fault. Moondragon pulls Drax aside to tell him about the vision she had of Phyla, and that she thinks she is still alive somewhere. On Sacrosanct, the homeworld of the Universal Church of Truth, the Matriarch addresses an unseen individual about their failure on Orison. 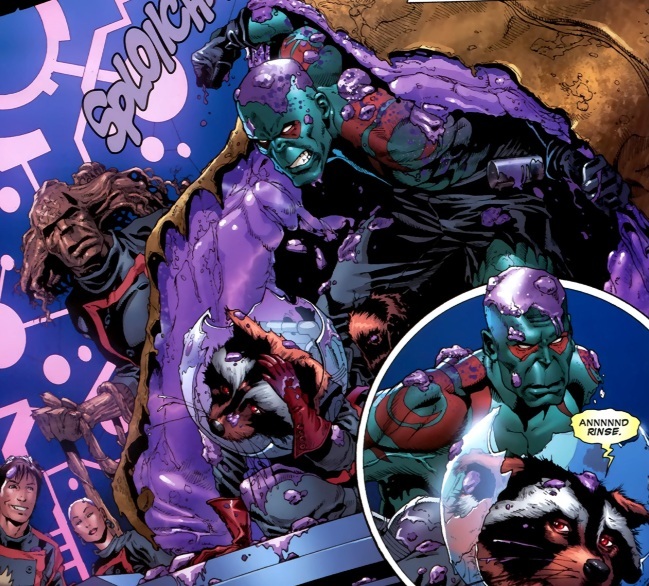 That individual is revealed to be a very much alive Magus, holding captive the bodies of Phyla, Cosmo, Major Victory, Mantis, and Gamora. My brain thoughts: Oh, that sneaky Magus, still alive and holding my beloved Gamora captive. My final brain thoughts: Dead dogs, nose parasites, pregnant bald telepaths, zealot religious groups, and elderly Star-Lord. This wasn’t the best stuff, but the worst Guardians of the Galaxy comic is still better than most other books out there. Having read this small run in full, it’s apparent what they were trying to do, but that still doesn’t make having to read a bunch of issues about Moondragon any better. The Magus is an interesting threat, and it’s obvious in retrospect that he wasn’t taken out so easily. I’m just glad to see Mantis, Cosmo, and Gamora are still kicking around, and I anxiously await their return. Unfortunately, Guardians of the Galaxy apparently was not tearing up the sales charts, so the book is nearing its end. Next time, we’ll take a look at the end of the series, all leading in to the final climatic mini-series that would wrap a figurative bow over the entire saga. Tears will be shed, fists will be shaken at the sky in anger, and not everyone will make it out alive.